Two years after she entered and won a competition to prove her prowess training recently-retired thoroughbreds, Lindsey Partridge has found her services in demand by movie producers, has won an acting award and has started an equine business that she has trademarked. 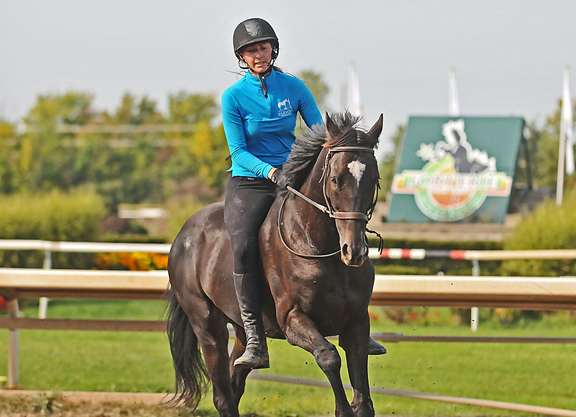 To say her life has been a whirlwind since the 2015 America’s Most Wanted Thoroughbred title-part of the Thoroughbred Makeover at the Kentucky Horse Park–is an understatement. (Watch the winning routine.) It has been a wild and fascinating ride for the Canadian horsewoman, who along with her husband James owns a farm in the town of Pontypool, an hour northeast of Woodbine Racetrack in Rexdale. How the 31-year-old, who has been dubbed the Canadian Horse Whisperer and will be competing in the 2017 America’s Most Wanted Thoroughbred tournament Oct. 5-8 at the Horse Park, transformed into an actress and business person can best be summed up as serendipity and a helpful mother. Partridge is president of a non-profit organization she founded called The Natural Horsemanship Association, which happened to receive a call from producers of Unbridled, a feature film about an abused girl and an abused horse and their journey to healing. It is based on true stories at a healing ranch for troubled girls in North Carolina. The producers were looking for a real horse trainer to add some credibility to the film, and when they called the Natural Horsemanship Association, the secretary, who is Partridge’s mother, put in a good word for her daughter. She auditioned two horses, Soar, who had won the tournament, and a Palomino called Dreamer. Both horses appear in the film, Dreamer in the lead role. Partridge had choreographed her horses to do some interesting moves, but working in a film proved to be a different experience, one that was exciting and nerve-wracking. “They ended up letting me do some improvements to come up with my own lines because it felt so scripted,” she said. “After working on the films I have a much bigger appreciation for the work that actors and actresses do. Not only did I have to remember the lines and repeat it, I had to be able to do it multiple times because they film from different angles. You have to remember the movement of your arms and how you walk and have the same expressions on your face because it all has to line up and flow when they change the cameras. Unbridled has won several awards at film festivals. Partridge won Best Supporting Actress at the 2017 Christian Film Festival. Because of her work in Unbridled, she met actress Jennifer Gotzon, who has a role in the film and is also co-producing a film called The Farmer and The Bell. Dreamer also appeared in that movie, which had some scenes filmed in New York last Christmas. One of the scenes had Dreamer in front of the Flat Iron Building wearing a pink onesie. The Farmer and The Bell is a comedy film about finding true love over the Christmas holidays. Subsequent to that movie opportunity, Partridge was contacted by a Canadian production company and participated in the filming of Autumn Stables that includes Heartland actors Cindy Busby and Kevin McGarry. Soar is cast as the leading horse in that movie, which is about a woman who is forced to sell her ranch and horses including her special ‘Spice’ that she used to race. Winning the 2015 tournament has also increased visibility for Partridge’s training method that she calls Harmony HorsemanshipTM. She is teaching it at the farm and has also made it available on-line at her website harmonyhorsemanship.ca. “It’s been a bit of a whirlwind, for sure, but it’s exciting because the way I train horses is very positive-reinforcement based, which is usually sort of shunned on in the equestrian community,” she says. “It’s interesting because every other form of animal training uses food rewards or positive reinforcement, whether it be dog training or dolphin training. But when it comes to horses, people take the approach of you add pressure or force and when the horse submits you release. “In Harmony Horsemanship, the saying is ‘ask, tell, and either wait, clarify or motivate.’ The actual training continuum and the exercises that are in Harmony Horsemanship are mostly things I figured out on my own just by playing with horses and realizing what it is that I do that gets them so calm and relaxed. “I have the Makeover to thank for that because after I won, people really wanted to know and learn from me what I do with horses. It took me a good year and a half to figure out what it is that I do in a way that I could explain it to people and teach them consistently. I hadn’t thought of it before. It was more intuitive. Now I’ve packaged it a little better so people can really take these exercises and use them with their horses and they are finding great results, which is really rewarding. Partridge made history in 2015 becoming the first Canadian to win the tournament, and doing so with a Canadian-bred. Last year, she made history again becoming the first trainer to qualify for the finals of three disciplines. There are 10 overall, with the winner of each receiving $5,000 of the $100,000 purse. Partridge placed first in Freestyle and Trail with Trivia Time, while Pentland finished third in Competitive Trail and Field Hunter. 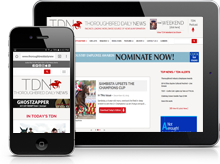 Lauren Turner won the overall Most Wanted Thoroughbred title, which was decided by crowd applause. The year before, judges determined the winner. Partridge is entering this year’s tournament with two horses – Bowdrie in Freestyle and Trail, and Here Comes Adri in Field Hunter and Trail. Partridge will be competing with an injured left hand after dropping a massive log on it, which split open a finger and caused some nerve damage.